Women's Opaque Hosiery are designed to help energize tired legs and feet, improve circulation, and ssist in the prevention of swelling and varicose veins. Oired with skirts or worn under slacks, opaque tights are warm winter-wardrobe staple. Women's Opaque Hosiery is available from super opaque for complete coverage and opaque for medium coverage. 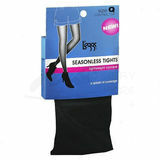 Hosiery sizes are uniquely designed to fit well every shape or size, no matter the size you are looking for. Women's Opaque Hosiery are made with breathable fibers and feature a soft knit-in waistband to prevent rolling and enhance comfort.